360 Difference 2018 | A robust, powerful, and scalable set of Estimating, Job Costing, Project & Business Management tools for Macintosh, iOS, and Windows. 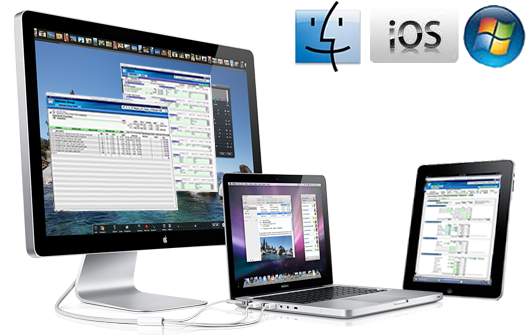 A robust, powerful, and scalable set of Estimating, Job Costing, Project & Business Management tools for Macintosh, iOS, and Windows that together make up an integrated small office /home office work environment that also meets the needs of larger builders and contractors too. 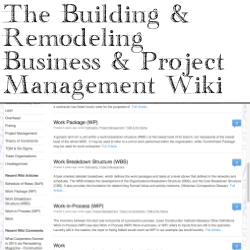 The lead module in our suite of FileMaker based database tools that works as a stand alone program allowing you as a contractors to produce precise accurate estimating data for the work your company performs based on your company’s own real compensation structure, productivity rates, and material costs. 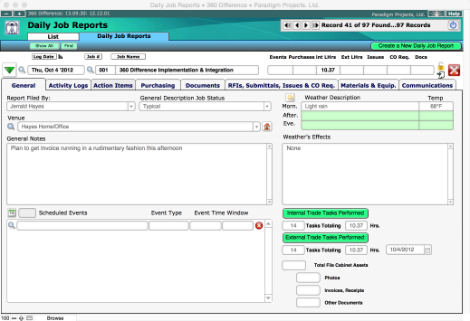 With the 360 Difference Production module a contractor can review and evaluate information collect in the field via our Daily Job Reports feature running on a laptop, iPad or even view that information as it’s collect in real time if the solution is remotely hosted in on one of our servers in the cloud. Run your 360 Difference System in the Cloud and access it from anywhere from any iPad running FileMaker Go or Macintosh or Windows Laptop computer running FileMaker Pro. Specialty contractors or even real cost conscious GCs may want and need a set of fully relational customized estimating data for their company’s operations. We can either either work with your staff to help you develop the data in-house or do all the R&D for you ourselves. 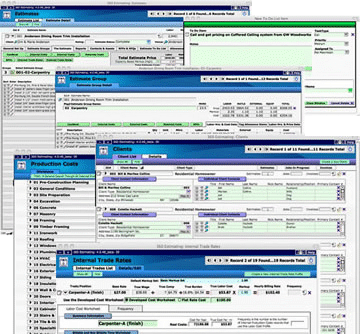 We also develop custom cross platform solutions in FileMaker Pro and FM Go for the iPad solutions for builders remodelers and trade contractors. We can host your 360 Difference solution on our servers in the cloud so you and your staff can connect and work from anywhere. 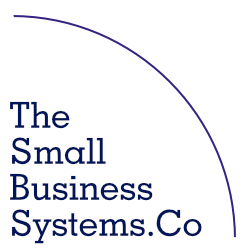 We offer a variety of support and training options to meet the needs of businesses from small one person operations to large enterprises.